Dear EarthTalk: I understand that Toyota is planning to sell a plug-in Prius that will greatly improve the car’s already impressive fuel efficiency. 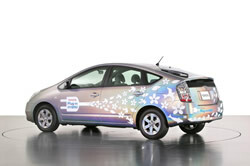 Will I be able to convert my older (2006) Prius to make it a plug-in hybrid vehicle? Toyota is readying a limited run of a plug-in Prius, which can average 100 miles per gallon, for use in government and commercial fleets starting in 2009. Toyota will monitor how these cars, which will have high efficiency lithium ion batteries that haven’t been fully tested yet, will hold up under everyday use. Essentially, a plug-in version of the Prius reverses the roles of the two motors under the hood. The regular Prius relies more on its gas engine, switching to (or combining) use of the electric motor in slow traffic, to maintain cruising speed, and when idling or backing up. The car doesn’t need to plug in because its battery stays charged by the gas motor and by the motion of the wheels and brakes. The plug-in will primarily use its electric motor, allowing commuters to go to and from work every day fully on the electric charge, saving the gas engine for longer trips that exceed the distance the car can go on electricity alone. Toyota has made no announcement yet as to when consumers will be able to buy a plug-in; that depends largely on the results of the field test of the fleet version. But owners of a current or past model don’t need to wait. Those with automotive mechanical skills can convert their Priuses to plug-ins themselves. “The conversion is an easy DIY [do-it-yourself] project that you can do for about $4,000, if you choose to use sealed lead acid batteries,” says Houston-based Jim Philippi, who converted his Prius last year, using instructions he downloaded for free from the Electric Auto Association’s PriusPlus.org website. Philippi recommends that DIYers consult Google’s RechargeIT.org as well for useful background information. For those less inclined to a DIY, several companies now sell readymade kits (some also have kits for converting Ford Escape Hybrid SUVs). Ontario-based Hymotion sells plug-in kits for Prius model years 2004-2008 for around $10,000 via contracted distributors/installers in San Francisco, Seattle and elsewhere. Other providers include Plug-In Conversions Corp., Plug-In Supply, EDrive Systems, Energy Control Systems Engineering Inc. and OEMtek. All typically work with select garages that specialize. One potential worry about conversions is whether or not Toyota will honor the warranty that came with the original vehicle. The California Cars Initiative (CCI), which has converted several hybrids to plug-ins for research and demonstration purposes (sorry, they’re not for sale), says the carmaker needs to clarify the matter, since hybrid cars typically have four or five separate warranties. There is legal precedent, CCI says, that modifications cannot completely void warranties—only the part(s) affected by a retrofit. If you’re looking to convert, keep in mind that such a move is not about cost-savings, as it will take some time for fuel savings to justify the upfront cost of even a DIY. Most people interested in such a conversion are doing it for the sake of the environment, not their pocketbooks. Dear EarthTalk: Can you recommend some sources for toys and other holiday gifts that are both safe and not harmful to the environment? Given the massive recall of toys contaminated with lead last year, let alone all the other bad news about chemicals seeping out of just about every other conceivable type of consumer item, it’s no wonder that people are nervous about what might be inside the wrapping paper this next holiday season. Luckily, growing environmental concerns—and consumer demand—means that plenty of safe and green-friendly items are available for those willing to do a little more than just walk around the closest shopping mall. For kids’ items, Oompa Toys is hard to beat. The Wisconsin-based company offers thousands of child- and Earth-safe items. On Oompa’s easy-to-use website you can buy products ranging from toys, dollhouses and stuffed animals to learning games, musical instruments and art supplies to kitchen play accessories, kids’ furniture and tricycles, many items made with organic or recycled materials. 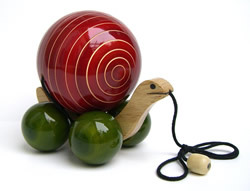 Another interesting online source for kids’ toys is Washington-based Earthentree, which sells dozens of pull toys, rattles, stackers and other goodies to stimulate young hands and minds. All of their products are hand-crafted by “fair trade” (fairly compensated) artisans in India using sustainably harvested wood and natural vegetable-based dyes. And Hazelnut Kids specializes in natural, earth-friendly wooden and organic cotton toys for kids and babies, and even offers gift-wrapping with recycled and recyclable paper. For grown-up gifts, EcoArtware sells a variety of items made from recycled and natural materials, from bath and kitchen accessories to pet products to jewelry, including many hand-made items. Everybodygreen is another good source for green-friendly jewelry. The company’s No Plastic charm bracelets are made with corn starch-based resin, natural herbal tea dye and recycled brass. For those holiday parties you might be attending, wine aficionados might appreciate a bottle of Boisset Family Estates’ Yellow Jersey pinot noir which comes from France in a 100 percent recycled (and recyclable) plastic bottle. Looking for fair trade arts and crafts? Gifts with Humanity sells clothing, home décor, jewelry and more from artists in Asia, Africa and Central and South America. Organic Bug also sells fair trade items and other natural and organic products from clothing to home décor items to travel accessories. Other websites worth visiting for fair trade and/or green-friendly gifts include peacefulvalleygreetings.com, greenfeet.com, pristineplanet.com, nokiagreenstore.com, gaiam.com, acacia.com and vivaterra.com. A simple Google search for “green holiday gifts” will turn up many more. Another approach to the holidays, of course, for the sake of lessening one’s footprint and tightening the belt in a downturned economy, is to eschew traditional gift-giving in favor of donating to a local or national environmental group in the name of a friend or loved one. This can be accomplished by visiting the websites of your favorite green groups and making your way to their “Donate” page, or by visiting justgive.org or worldofgood.com (by eBay), both which facilitate contributions to worthwhile charities. GOT AN ENVIRONMENTAL QUESTION? Send it to: EarthTalk, c/o E/The Environmental Magazine, P.O. Box 5098, Westport, CT 06881; submit it at: www.emagazine.com/earthtalk/thisweek/, or e-mail: earthtalk[at]emagazine.com. Great news on the auto front, this has been a long time coming – if only our own government had been pushing this along instead of the hydrogen pipe dream. Also, great links for eco gifts – just in time for the holidays!